What if I had to answer that debate question? “What racial blind spots do you have?” CNN’s Don Lemon asked Bernie Sanders and Hillary Clinton. Their answers weren’t all that impressive, and I suppose I shouldn’t have expected them to be. After all, the question resembles the standard “What is your biggest weakness?” challenge that job interviewers have been throwing at applicants forever, usually with disappointing results. Probably nobody’s answer to Lemon’s question would be 100% accurate, because your biggest blind spots are always the ones you aren’t aware of, what Donald Rumsfeld used to call the “unknown unknowns“. If you can describe a blind spot, you’ve already taken a step towards filling it in. So while it would be easy to stand in judgment over Bernie and Hillary’s answers, the more interesting question is: How would I answer Don Lemon? What are my racial blind spots? Blind spots come mainly from the holes in a person’s experience, and I certainly have some. As a white person, I have been in the racial majority almost everywhere I’ve gone. I grew up in a mostly white neighborhood, went to mostly white schools, and earned my living in mostly white workplaces. In stores I (mostly) stand in line with other whites. If I find myself sitting next to a stranger at a bar, it’s usually another white. On TV dramas, I mostly watch white people deal with the problems of other white people. And on TV news shows — Don Lemon notwithstanding — I mostly watch whites interview other whites. Being white may not be mandatory in my world, but it is normal. I understand that not every white person’s experience is that limited. You might have been the one white guy on your high school basketball team, or the lone white waitress at a Mexican restaurant, or something like that. But I never was. And that (lack of) experience gave me this blind spot: Thinking about race seems optional to me. It’s not that I don’t think about race, or about the ways that non-whites’ lives are different from mine. Those sorts of issues come up all the time on this blog. I’ve written about how the Obamas’ experience in the White House has been different than other First Families. I’ve researched the racial history that my formal education swept under the rug. I wrote about Trayvon Martin and Ferguson. I’ve explained what dog whistles are, and how to notice them. But I think about that stuff when I choose to. I have, for example, read Maya Angelou’s I Know Why the Caged Bird Sings. And while I was reading, I thought a lot about growing up black in the Jim Crow South. But as soon as I put that book down, Angelou’s reality vanished for me as completely as Westeros does when a Game of Thrones episode ends. And so, I have a hard time grasping that thinking about race isn’t optional for American blacks. To be black in America is to be constantly aware that many of the people around you are white, and that they might at any moment start reacting strangely to your blackness. Another story concerned Glaude’s son Langston, who he sent to Brown. Langston’s urban studies class was assigned to visit a rich Providence neighborhood and make various observations. But in a wealthy neighborhood, a young black man sitting on a park bench with a notebook draws police attention, and being an Ivy League student or the son of an Ivy League professor is no excuse. With a hand on a weapon, a policeman intimidated Langston until he voluntarily left. You can listen to stories like that (which nearly all blacks seem to have) and think: “Those are just isolated incidents. I’ll bet that doesn’t happen very often.” But how often would it have to happen before you came to the conclusion that you had to be on your guard all the time? But I can forget about race whenever I want, and so sometimes it seems strange to me that they don’t. 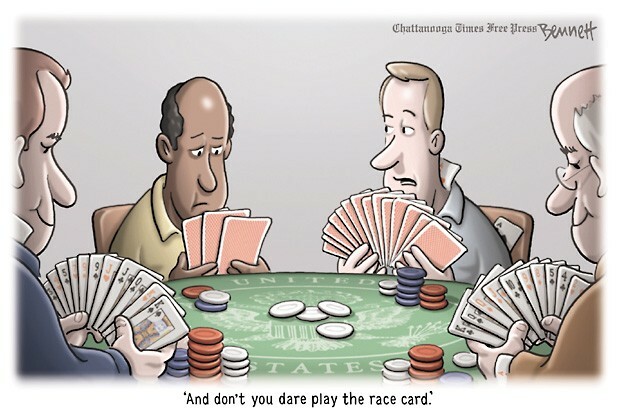 “I don’t see race,” a lot of whites say, and I know what they mean: Of course I notice that the new guy at work is black, but it’s not a thing. I’m not going to go all In the Heat of the Night on him and act like black people shouldn’t have these sorts of jobs. I’m not going to harass him or insult him or treat him badly in any conscious way. If somebody makes it a thing, it’s not going to be me. Because that’s how my blind spot tempts me to think about race: It’s optional. I can choose not to think about being white and he can choose not to think about being black, and then there won’t be any race problem. But the new guy can’t just stop thinking about being black, any more than I could stop thinking about being white if somebody dropped me into the middle of Africa. What’s more, he shouldn’t, for the sake of his own safety. What if, when the policeman put his hand on his gun, Langston Gaude hadn’t thought about being black, and instead had thought about being an American citizen in a place where he had every right to be? Might he not have become the next Eric Garner or John Crawford? That’s what “the talk” is about: Making sure that when the police show up, your black son will never forget that he’s black. If you’re black in America, you never know when your blackness is going to become an issue. And if it is becoming an issue, you’d better not be slow to catch on, because you’ll need to implement some strategy — challenge, retreat, deflect, avoid — before things get out of hand. Of course, race wouldn’t seem optional to me if I didn’t also have a second blind spot: a belief that unconscious racism doesn’t count. If I’m not trying to be a racist, well, that should be good enough. So of course it would be wrong for me to say (or even to think) “I don’t want to hire that guy because he’s black.” But if I just have a bad feeling about him, while one of his white competitors impresses me for no quantifiable reason — what’s wrong with that? Don’t I have a right to have hunches about people? Sure I do. But before I act on those hunches, I ought to take into account the ways my thinking and feeling have been shaped by the cultural stereotypes built up over centuries. Even today, being black in America is like playing golf on a course that is more sandtrap than fairway. Getting to the green isn’t impossible, but just about anything blacks do exposes them to negative judgment, because there’s a very narrow path between lazy and pushy, between too sloppy and too flashy, between looking stupid and being a know-it-all, between refusing to stand up for yourself and being scary. That cellphone he’s taking out of his pocket looks like a gun because … well, it just does. And when Barack Obama acts like he’s President of the United States, it looks uppity. Who does he think he is? We may not call people niggers any more, but the stereotypes that were designed to keep niggers in their place are still with us. But if unconscious racism is something I have to take into account, then I have to think about race all the time. And that’s another thing to project onto blacks and resent: Why do they make everything about race? Why can’t we just be people together? But I don’t know how to be people together with everyone, regardless of race. All I know is how not to notice when I’m failing. I can just take all that evidence and shove it into a blind spot. As a white person living in a majority Black and Hispanic area of a major city, I try to confront my blind spots by simply assuming I’m a racist and filtering interactions through that: “am I reacting in some specific way for rational reasons, or for rationaLIZED reasons”? I take small positive steps– after Trayvon I stopped reflexively crossing the street whenever someone (which in my neighborhood pretty much means a Black person) was approaching me. If they’re walking in my neighborhood, then they’re neighbors. Period. The blind spot I have trouble getting past is my need for POC to understand that I’m doing this–they don’t see me as an “ally” in the current parlance. They still see a potential danger. It’s a long road. Even as a mother of bi-racial children, I am aware that I can never truly know what it’s like to live in our society as a black person. I remember being taken aback when a black friend cheered at the not guilty verdict in OJ Simpson’s murder trial, because I thought he was guilty, and I did not understand how the justice system is stacked against black people, and how she saw herself in his shoes. I’m a bit more enlightened about that now, but I do know that I benefit from white privilege, and I don’t always notice how. This is an excellent article. Thank you. I always look forward to your posts on Monday mornings. Thanks for another thoughtful article. This reminds me of something I overheard a young kid saying about 10 years ago. He was trying to remember a joke that he heard somewhere and started like this: “so there is a black guy, a Mexican guy, and a regular guy…” The kid had learned that black and Mexican people had race, but he saw himself as regular, or default. He hadn’t learned yet that white is just as much a race as black. He didn’t have to think about race as it applied to him. He was also pretty darn young to be repeating radicalized jokes. I hope he turned out okay. In third grade our teacher had us do an exercise during science class to demonstrate the existence of the physiological blind spot https://en.wikipedia.org/wiki/Blind_spot_%28vision%29 that exists in each of our eyes. This blew my mind, and made me realize that my own brain was essentially lying to “me” by showing me only what it “decided” at a subconscious level that “I” needed to see. That took me down a path to develop what I believe to be a healthy level of skepticism of everything, my own beliefs and impressions included. Unfortunately, none of my classmates seemed to be impressed by this revelation, and went on blissfully believing what their lying brains “told” them. I have a feeling that most people would react the same way. A very thoughtful post. I’m reminded of someone plagued with obsessional thinking. It’s as if millions, through no fault of their own, must live with this racially-induced, obsessional thinking for the rest of their lives. This is an excellent article, thank you for writing this. I think it’s especially important for liberal/progressive folks to read these kinds of things – there is still plenty of racism (and sexism) on the left, but we tend to brush it aside because it’s not as blatant as we see from reactionaries on the right. I think the first step is recognizing that you have these unconscious biases. When I hear a white person railing against “political correctness” or complaining about how minorities are demanding “special privileges,” part of what’s upsetting them is being confronted with evidence of this inherent bias, and they don’t appreciate having this pointed out to them. Brave post. Every person needs to look hard at his or her own upbringing and how it’s influenced their thinking about race. You’re brave to put your thoughts out there for all to see and comment on. I admit I think about race a lot. It’s been interesting to watch how my metro area has changed from predominantly white to a quilt of diversity. I now hear more than English on my commute to work on the city bus — Spanish, Farsi, Arabic, Somali, Vietnamese, Hindi, German, and French among other languages. I feel that I live in a world city instead of an American one. But that doesn’t mean racism isn’t alive and well here.